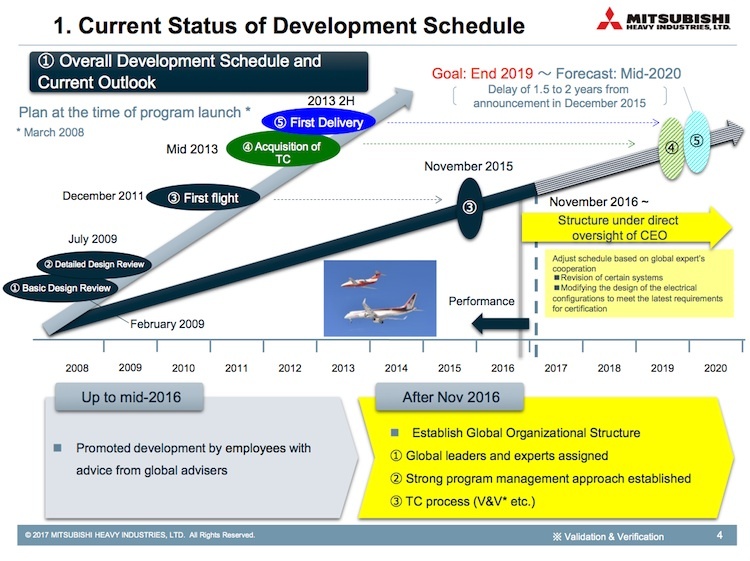 Mitsubishi Aircraft Corporation has pushed back first delivery of its troubled Mitsubishi Regional Jet (MRJ) program by two years from mid-2018 to mid-2020 due to some design changes to the aircraft systems and electronics. “The change is due to revisions of certain systems and electrical configurations on the aircraft to meet the latest requirements for certification,” Mitsubishi said in a statement on Monday. It is the fifth delay to the MRJ since the program was announced in March 2008. Launch customer All Nippon Airways (ANA) was originally expected to take delivery of the first aircraft in 2013. Mitsubishi said type certification for the aircraft was scheduled for 2019. Greater use of foreign experts would help fast-track the development of the MRJ, while a recently established business promotion committee chaired by Mitsubishi Heavy Industries (MHI) president and chief executive Shunichi Miyanaga would “oversee the continued development and long-term business performance of the MRJ”. “MHI is focused on supplying a comfortable, reliable, high-performance passenger aircraft with the world-class safety and operational support services,” the company said. The company said the design changes would not affect aircraft performance, fuel consumption, or functionality of systems. 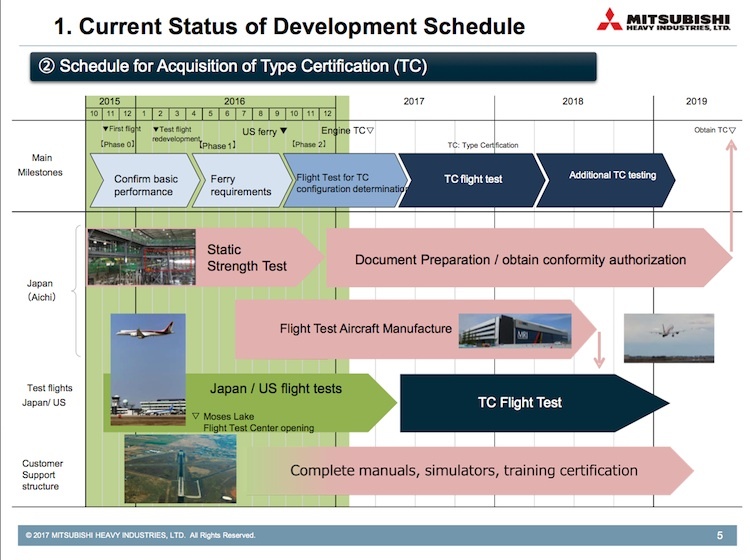 “We will continue with ongoing flight test program with current test aircraft configuration and obtain certification flight test data of performance, flight characteristics for type certificate,” Mitsubishi said. Currently, Mitsubishi has three flight test aircraft based at the company’s Moses Lake Flight Test Centre in Washington State. A fourth test aircraft is flying at its Nagoya facility. Mitsubishi planned to eventually have five flight test aircraft in the program. To date, the MRJ has received 233 firm orders, 170 options and 24 purchase rights for the aircraft from the likes of launch customer ANA, Japan Airlines, Eastern Air Lines Group, US-based Skywest, Trans States Holdings and Myanmar-based Air Mandalay. The MRJ, with its distinctive pointed nose, competes with Bombardier’s CSeries and Embraer’s E-jet family in the less-than-100-seats market. It is powered by Pratt & Whitney PW1200 geared turbofan engines and available in either the 90-seat MRJ90 or 70-seat MRJ70 models. The MRJ is Japan’s first locally-produced commercial passenger aircraft since the country stopped making the YS-11 in 1974. A 7 year delivery delay, shades of the B787.